The 20 Year Anniversary Edition of the Buddha flash is exactly what the Buddha has always been: a top-class IDE controller. By popular demand, a new production run of the successful Z2 controller was made. The technical data remain the same: Buddha is an IDE controller for all Amiga computers with Zorro slots. In addition to two IDE-ports, there is a clock port for hardware originally designed for the A1200 computer. 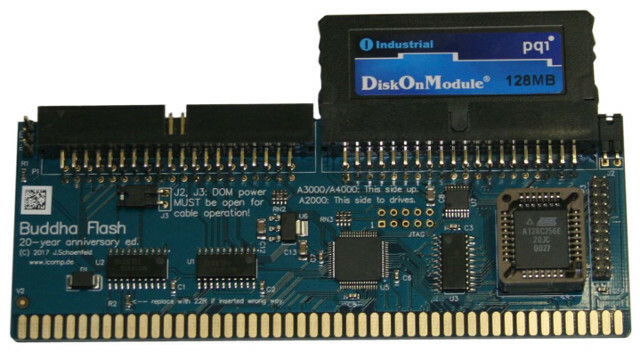 A new feature of the controller is that the IDE ports can supply power for a DOM ("disk on module"). Modern 3.3V technology saves power and only causes moderate temperature increase inside the computer. Hard disks or solid state media can be prepared with HDToolbox or the iComp installer, which complements the software package that comes with the 20 Year Anniversary Edition of the Buddha controller: Licenced OS versions 1.3, 2.1 and 3.1 from Hyperion come on a 128 MByte DOM which is included in its price. The automatic installer makes preparing a hard disk easier than any other software did before: Just a few mouse clicks, and even the rather complicated process of installing media with a 64-bit file system is complete. The installer brings the ease of use of today's computers to the computer system that introduced simple usability to the computer market in the 1980s. The Linux and NetBSD drivers for older versions of the Buddha controller can be used with this new version without change. Scope of delivery: Controller, software on 128 MByte DOM, printed installation instructions. Caution: UDMA cables cannot be used with this controller. (**): performance depends on installed accelerator. Maximum transfer rate can be reached with 68020 and 68030 CPUs.